It can be difficult for anyone to admit that his or her daily life is not as functional as it used to be. For a senior, especially, it may feel like giving up on life altogether to agree that a different living solution is necessary. The comforts of home, the years of memories, and a sense of dignity and independence all seem to be slipping at once. But when it's obvious that a change is necessary, we understand. Although we know it's hard, at Spring Gate Rehabilitation and Healthcare Center, we are here to help. It doesn't have to feel this way. The decision to enroll a patient in a long-term care program often comes from an initial short-term stay. 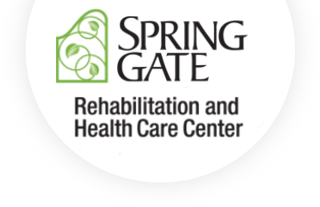 Because of the benefits the patient and their families receive, Spring Gate Rehabilitation and Healthcare Center becomes a comfortable choice for everyone involved. That's because we never forget to make our patients feel at home. Our top-rated care-based center has earned its reputation through its complete dedication to the patients. Spring Gate Rehabilitation and Healthcare Center's team of expert rehabilitation therapists is the finest in the area. Together, we ensure that the road to wellness is a tailored plan for each patient based on his/her own specific needs.